President Donald Trump’s repeated statements that he prefers to meet with adversaries as opposed to allies of the United States helps feed the perception that his foreign policy is entirely capricious and personality-driven, with no respect for the long-term relationships with close Western allies that have given American power the consensus needed for global leadership. Obviously, when the President is doing better cultivating relationships with with the nation’s enemies than our allies, something is amiss. Also, the Russians helped him become President. So this is all, fair to say, very troubling. So we are now at the point of hearing the verbatim words of the President of the United States, and Cory Gardner is reduced to simply denying the President meant what he plainly said. Gardner has sometimes been able to redirect the President’s outlandish pronouncements back into a coherent framework that doesn’t do huge damage to the nation’s stated policy objectives, but there’s just nothing to work with here. Even Con Man Cory can’t spin it anymore. It’s as bad as it looks. Nutteranus say: Nothing to see here. Also, Nutteranus, how does locking kids in cages MAGA? 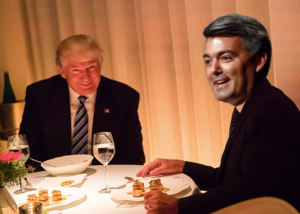 GODDAMN I can't wait until Hickenlooper demolishes this fucker in 2020. Wonder how Sen. Gardner, member of the Commission on Security and Cooperation in Europe — a joint committee of the Senate and House — would characterize Trump's new demand that NATO nations should be spending 4% of GDP on defense. Is he in favor of the US boosting defense spending to that level? Given the current situation of most NATO members trying to rise to 2%, will Trump asking for more contribute to Security and Cooperation? If you're silent you're complicit.